Setting up iCloud (s aapl) on your iOS 5 device is actually pretty easy, especially because Apple gives you the option to either use your existing Apple ID or set up an entirely new account to get the process started. Here’s how it works, from beginning to end. 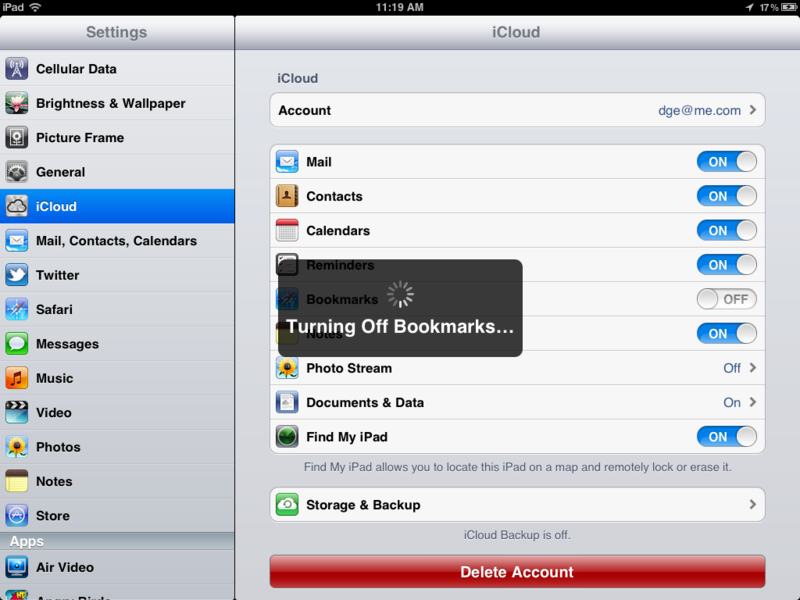 First, go to the Settings > iCloud screen on your iOS device. By default, Apple will begin with the email address for the Apple ID you use to make purchases via the iTunes Store on your device entered into the sign-up field. 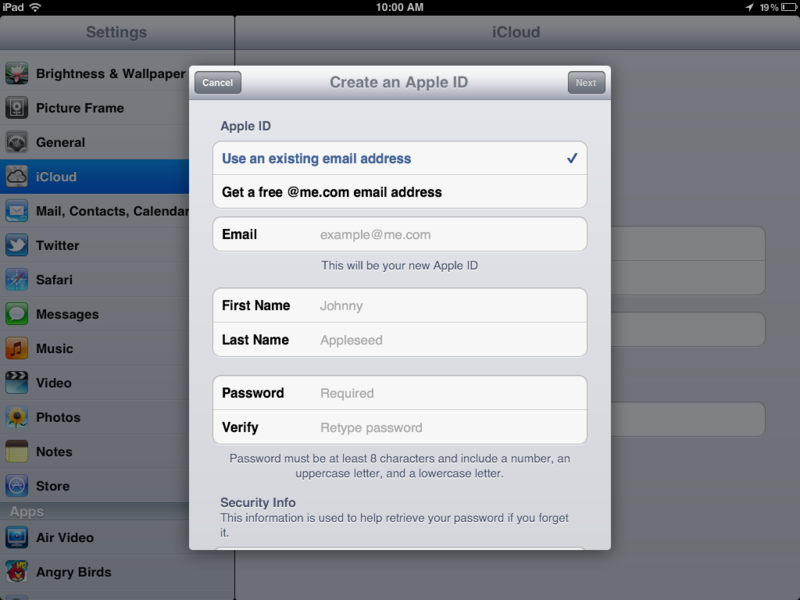 If you want to use that ID to create your new iCloud ID, then go ahead and sign in. If not, click the “Get a Free Apple ID” link at the bottom of the Settings page. If you choose to use an existing Apple ID, you’ll simply have to sign in with your credentials, then agree to iCloud’s terms and conditions. Apple will send out an account verification email to the address that is your Apple ID, which you can then follow a link from to complete the process. If you choose to create a new Apple ID, you’ll be guided through the entire sign-up process on your iPhone or iPad. Once verified, iCloud will automatically turn syncing on for most services, and ask your permission to either merge or replace data on your device, as well as use your location for Find My iPhone, iPad or iPod touch. Whether to merge or replace your data is up to you. 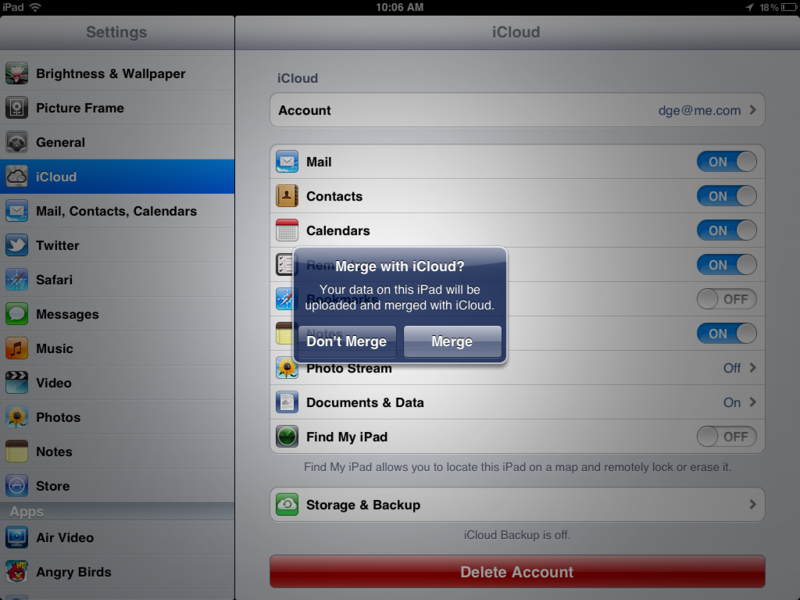 Merging is probably the safe bet in most cases, since even if you don’t yet have anything on the cloud, it won’t affect what you have on your device. Even in cases where you have a lot of duplicate information on your device and already on iCloud from a previous setup on your Mac or elsewhere, I’ve found that Apple’s service is smart about what to keep, and where to put what information, so there’s little clean-up required after the fact. You can selectively set which data does and doesn’t sync via iCloud once you have it set up on your device. Your options include Mail, Contacts, Calendars, Reminders, Bookmarks, Notes, Photo Stream, Documents & Data and Photo Stream. For Documents & Data, you can choose to allow iCloud to sync that information either only over Wi-Fi, or over both Wi-Fi and 3G. As developers incorporate Documents in the Cloud into their apps, this will become more important for customers looking to ease their 3G mobile bandwidth usage. 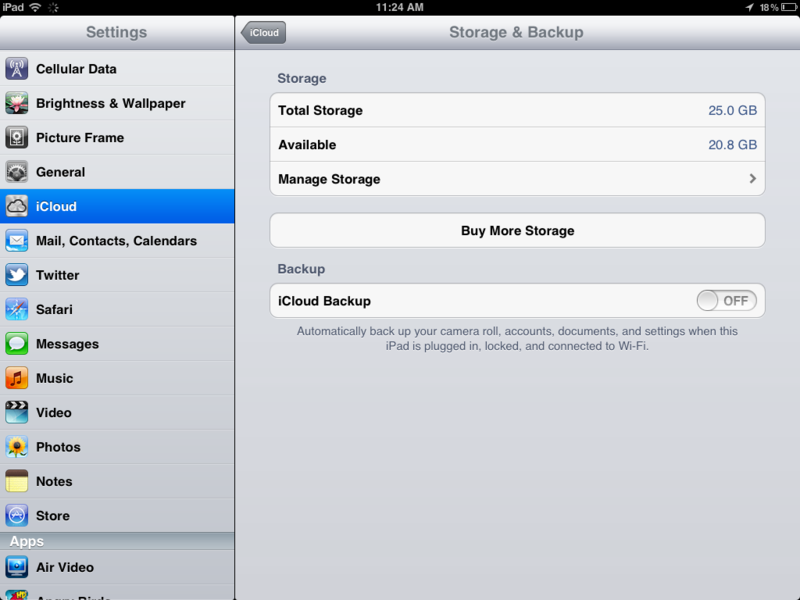 Note that you can also opt to back up your device to iCloud. This will work the same as a backup in iTunes, allowing you to remotely restore your iPhone’s settings, some content and information. Note that this backs up the camera roll, account information, documents and settings. You’ll have to replace any movies or music from iTunes on your device manually, as well as reinstall any apps in the event of needing to restore from an iCloud backup. 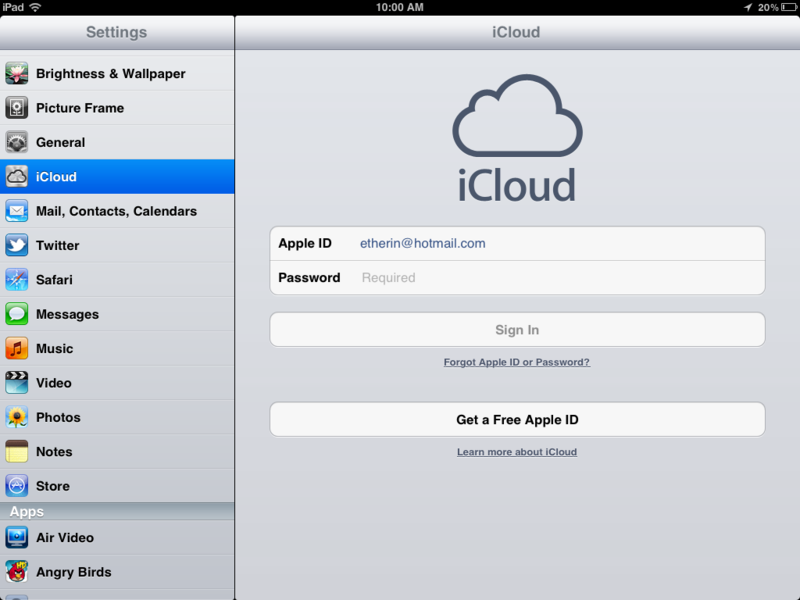 Apple’s iCloud works together with some official apps from Apple, too. To complete your iCloud experience, go ahead and download Find My iPhone and Find My Friends from the App Store. These will help you locate your own device should you lose it, locate friends and family on a map if they choose to share their location with you, and vice versa. You can also grab Apple’s iWork apps from the App Store if you want to see Document syncing via iCloud in action, but note that these cost money. iCloud comes free with 5 GB of storage, but if you shoot a lot of video or backup many devices to the service, you might just want to upgrade your storage options. $20 a year gets you 15 GB total, $40 per year allows for 25 GB, and $100 a year will provide 55 GB of iCloud storage. You can upgrade to each option (or downgrade for your next payment cycle) via the iCloud settings on your device. It isn’t too difficult to set up, but I’d be curious to see what percentage of iOS buyers end up going through with it. Are you planning to use iCloud? If you are, do you foresee any reason to need to upgrade your storage level? A little more sinister than …. just joining the cloud!! My SETTINGS page on ipad has no ICLOUD icon. Ioud wii not accept password. Even after turning off /on income to the configure page. Also I can not use apps on IPhone. I touch it jumps, that is all thru do. i downloaded the icloud app on my phone and then decided to deleted it, but all my phone numbers have disappeared , how do i get them back? someone texted me and there name reappeared with there number, so my numbers must all be stored somewhere on my phone? i have the same problem. icloud does not show up on my ipad settings menu. Did you ever find a solution. For people like you, Apple should start back charging $129 for OS updates. Stop complaining. No one cares if you’re not going to do it. I’m having so much trouble setting up iCloud. I keep imputing the right info, but it keeps saying that Apple ID or password is wrong. I even changed my password to see if that would help, but it didn’t. i’m having the EXACT same problem. migrated my mobileme to iCloud and it was working fine, and this AM, everytime i check mail on my iPhone for that account, i’m told my credentials are incorrect. i go to settings, it says VERIFIED, and then back to the drawing board with the same problem. and i’m also told that i’m not receiving texts from anyone – and visual voicemail is completely gone. i’m really regretting making the switch to iOS5 because for me, the only real difference i see is notifications, and if i’m not getting email/texts/VMs, what’s the point? SO frustrated. I entered the correct Apple ID but it picked another one. I have two ID’s, one for purchases and 1 mobile me. I noticed in the screenshots you started with your hotmail apple ID, and then later you have your MobileMe Address. Did you merge your existing mobleme after signing in with your apple ID or is it a new @me.com address? Thanks for letting us know, Veit. We were all wondering what you were going to do about iCloud. Excellent. I should also go find some blog that I’m not using and let everyone know I won’t be using their services. What the hell was the point of posting that comment? you do realize your are on an Icloud forum..right? Are you crazy? Why are you suggesting that people could use a different account if they already have one? That will just cause a mess once people realize that their music sync, app sync, and phone are on different accounts that apple won’t merge.